Another view which owes its existence to the Victorians is that from the walkways adjoining the twin towers of the iconic Tower Bridge. 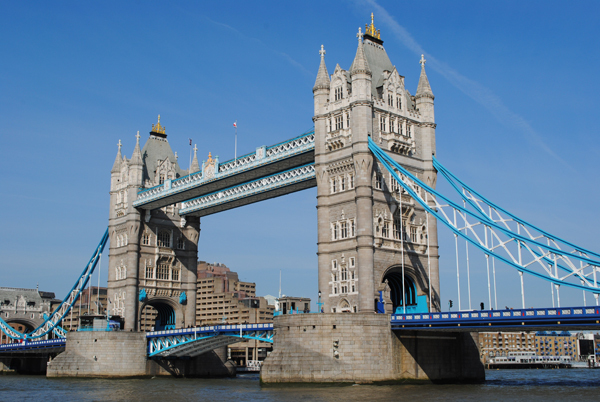 Built between 1886 and 1894, the bridge, the most sophisticated bascule bridge then in existence, was designed with two open-to-the-elements high level walkways, located 42 metres above the Thames, which enabled pedestrians to cross the bridge even when it was raised. But the walkways didn’t prove popular – people apparently preferred to wait until the bridge was lowered rather than climb the 200 or so steps up and then down to use the walkways. The absence of people meant the walkways became the haunt of some ‘disreputable’ people – prostitutes and pickpockets are the most commonly cited. In 1910, they were closed. It wasn’t until 1982 that the walkways were opened up once again, allowing visitors to enjoy a view that had been barred to the public for some 72 years. As well as providing panoramic views to the east and west down the River Thames, the walkways these days contain an exhibition on ‘Great Bridges of the World’ as well as, since 2014, the chance to walk on the 11 metre long glass floor (and, if it’s not doing so in real life, see the bridge raised below via the augmented reality ‘Raise the Bridge’ app). And don’t worry, the steps have been joined by elevators for those who can’t make the stair climb. 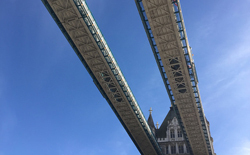 WHERE: Tower Bridge (nearest Tube station is Tower Hill and London Bridge); WHEN: 10am to 5.30pm (until September); COST: £9.80 an adult/£3.90 child (aged five to 15)/£6.80 adult concession (family tickets also available as well as joint tickets to the Monument); WEBSITE: www.towerbridge.org.uk/walkways.